The Jaguars are 3-5, losers of four straight games, and are likely finished as a playoff contender. They will need to go 6-2 at a minimum to have a chance at either the AFC South title or one of the two wild-card berths. Can it happen? Yes. There are certain things a team must have to make a second-half surge. The Jaguars have several key ingredients. Here they are. The Jaguars finally have running back Leonard Fournette back on the practice field after missing six games with a hamstring injury. He’s yet to play a second-half snap this season. Fournette was a full participant in Wednesday’s practice, a tremendous sign that he’ll be ready for Sunday’s game at Indianapolis. Fournette averaged 103 yards per game of offense as a rookie last season, scoring 10 touchdowns in the regular season and four in the playoffs. The Jaguars offense hasn’t been able to cultivate its identity as a power-run team without Fournette. The Jaguars are going to need a monster second-half from Fournette. Aiming for 900 yards of total offense and nine touchdowns should be the goal. That would help struggling quarterback Blake Bortles get back in a groove and help minimize the damage when he’ll be off his game. The bye week also helped the offensive line. All-Pro left guard Andrew Norwell (foot), center Brandon Linder (knee) and right tackle Jermey Parnell (shoulder) were mainstays on the injury report heading into the break but played through their ailments. None appeared on the Wednesday injury report. Indianapolis has star quarterback Andrew Luck back and is playing well, but this matchup still favors the Jaguars. The Colts (3-5) are better in the trenches than the last two years, but the Jaguars still have a sizable advantage on both sides of the ball. The Jaguars have won four of the last five games against the Colts, including a 57-10 sweep last season. If the Jaguars win Sunday, momentum will be established. The Jaguars defense has underachieved. The miserable offense factors into that, but if it can pick up the production the defense will be out of excuses. This is still a potentially elite unit, armed with eight Pro-Bowl players. Pro-Bowl cornerback A.J. Bouye’s calf injury is a concern, but the Jaguars are largely healthy on defense. Nickel corners D.J. Hayden and Tyler Patmon both return from injury coming out of the bye week. Pro-Bowl linebacker Telvin Smith needs to shake off a disappointing first half. 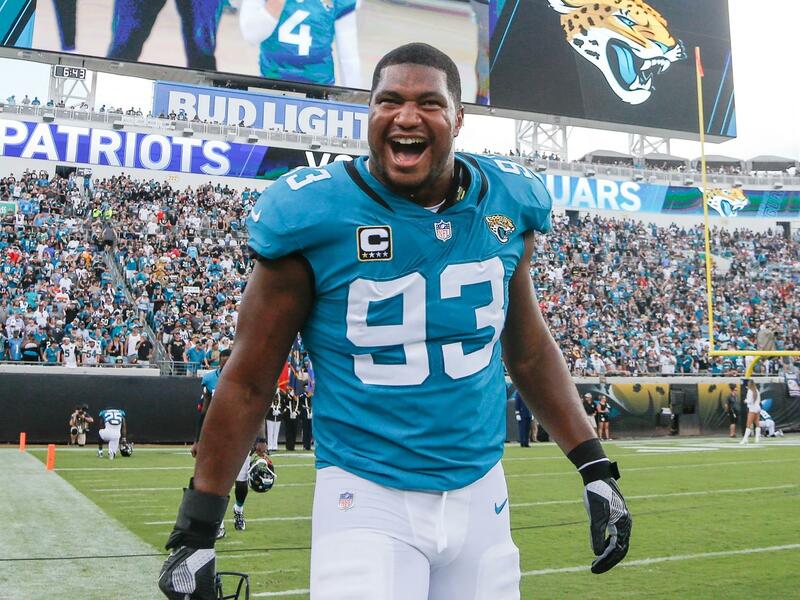 Still, this remains a defense that makes opposing offensive coordinators worry about Pro Bowlers at both end spots (Calais Campbell and Yannick Ngakoue), both tackle spots (Malik Jackson and Marcell Dareus), cornerback (Jalen Ramsey) and free safety (Tashaun Gipson). The defense has to get back to its 2017 form over the final eight games. The good news is that is not an unreasonable request. This works two ways. Fewer than 10 percent of NFL teams that start 3-5 make the playoffs. For a team perpetually looking for the chip to place on their collective shoulders, that should make them perk up. You can accomplish something few have — something no one thinks you can. There are also examples of success through adversity in the franchise. Jaguars personnel chief Tom Coughlin coached the New York Giants to a Super Bowl victory in 2011. That team lost four consecutive games and five of six overall to drop to 7-7. They won their last two to finish 9-7, got hot at the right time and won the Super Bowl. The 1996 Jaguars, coached by Coughlin, started 3-6 and reached the AFC title game after rallying to a 9-7 finish. If that team did it from 3-6, why can’t this one do it from 3-5? Perhaps Coughlin and coach Doug Marrone should show the Jaguars cut ups of all the mistakes the Giants and Jaguars made in those losing skids and then show them a highlight reel of their eventual success to visually hammer the point home. This can be done. The Jaguars play the Colts twice, with games at home against Pittsburgh (5-2-1) and at Buffalo (2-7) in between. There is a chance at 4-0 here, but even 3-1 would get the Jaguars to 6-6 heading into the final quarter of the season. That would keep them in the mix. The Jaguars do play three of their final four games on the road. None of the teams are elite or woeful. The Jaguars close with games at Tennessee (4-4), vs. Washington (5-3), at Miami (5-4) and at Houston (6-3). If the Jaguars can go 3-1 or 4-0 in the next four games, they’ll be back in the playoff mix and will get a key reinforcement. Tight end Austin Seferian-Jenkins is expected to return off of injured reserve with a core muscle injury in time for the Tennessee game in Nashville on Dec. 6. Seferian-Jenkins could be back for the final four games of the regular season. That would be a difference maker in the run game, while also giving the offense a reliable receiver. Any team that makes a second-half surge has to have a player that emerges to make a positive impact. The offense has two candidates in running back Carlos Hyde and rookie receiver DJ Chark. Hyde was acquired in a trade from Cleveland on Oct. 19. He’s had enough time to get up to speed where he can be effective in a 20-snap role for the Jaguars. If the ground game doesn’t drop off when Fournette gets a break, the offense will get a boost. Chark got his first extended playing time (48 snaps) in the loss to Philadelphia heading into the bye. The second-round pick is starting to pick things up and could be headed for a breakthrough second half. Defensively, first-round pick Taven Bryan is a good candidate, especially after the Jaguars traded end Dante Fowler to the Los Angeles Rams prior to the deadline. Bryan has been largely invisible in his snaps, so any contribution will be noticeable.